Alanna Mallon, program director for Food for Free, hands out onions and other produce to families at Longfellow Elementary School. CAMBRIDGE — An hour after dismissal, a line of parents and their exuberant children has already formed outside the large activity room in the Kennedy-Longfellow School, waiting for the monthly K-Lo Market to open. Beautiful bunches of kale, glorious mounds of violet eggplant, piles of potatoes, baskets of bright green beans, and staples such as eggs, cereal, and canned tuna are arranged on tables as attractively as at any urban winter market. Instead of chatting with growers, though, customers here interact with their children’s teachers, principal, and community volunteers. And they pay nothing for the bags of food they bring home. 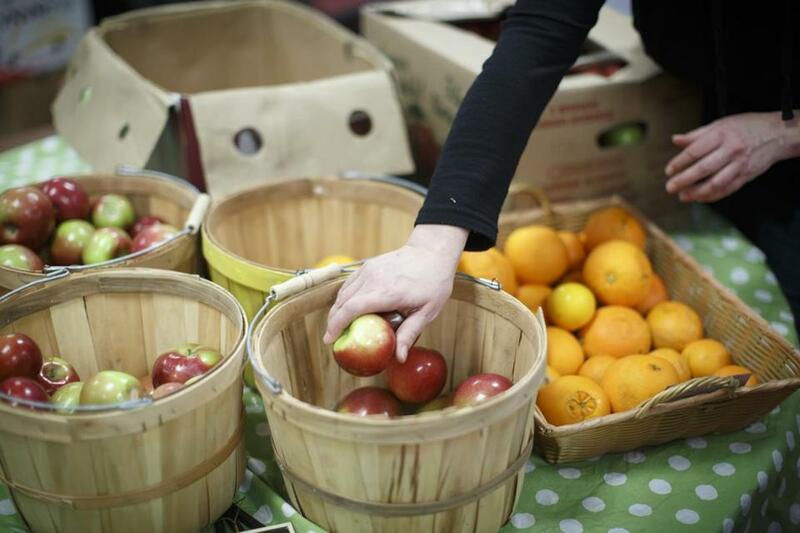 The year-old market, one of three in the city’s public elementary schools, is part of a multi-prong effort to help children struggling with food insecurity. It grew out of the Cambridge Weekend Backpack Program, initiated three years ago by Alanna Mallon, parent of two Tobin Montessori School students. That program started with 10 children at Tobin and has grown to include 358 students at 14 schools (11 elementary and three upper). A pilot effort to send home frozen meals launched at Kennedy-Longfellow in December. Renowned as a seat of intellectual activity, cutting-edge technology, and some of the region’s hippest and most highly regarded dining spots, Cambridge is not typically associated with hunger. Yet 45 percent of public-school students qualify for free or reduced-price lunches. Driving home from work shortly after Christmas in 2012, Mallon, a former children’s clothing designer, heard a story on NPR about how difficult school breaks — and even weekends — can be for children who rely on cafeteria meals for the bulk of their nutrition. The report mentioned backpack programs, which provide weekend breakfasts and lunches for children who qualify for reduced-price meals at school. “I wondered if Cambridge had something like that,” she says. When Mallon approached administrators at Tobin, they said they would support a backpack program if she could find the money and volunteers. The pilot effort, funded by private donors and businesses in the community, served 10 families at the school. By the end of the school year, teachers reported the children were more engaged and had better attendance records, and their parents were more involved. 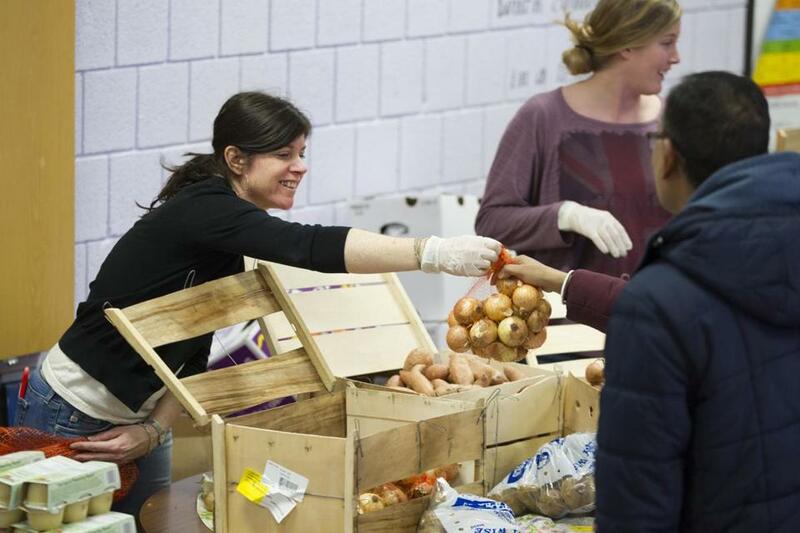 This January, Boston-based food rescue organization Food for Free, a partner since the beginning, adopted the fast-growing backpack program and hired Mallon as program director to oversee multiple projects. In October, students in the culinary arts program at Cambridge Rindge and Latin School began storing and distributing food for the backpacks. They spend a portion of class time over three days on the project, making sure each school receives the correct number of each item. “The counting is the most frustrating part,” notes Brianna Zion, a senior. The faculty created a complementary food justice unit. “Alanna approaching us about the backpack program was the trigger,” notes Cathy Thomas, a teacher. 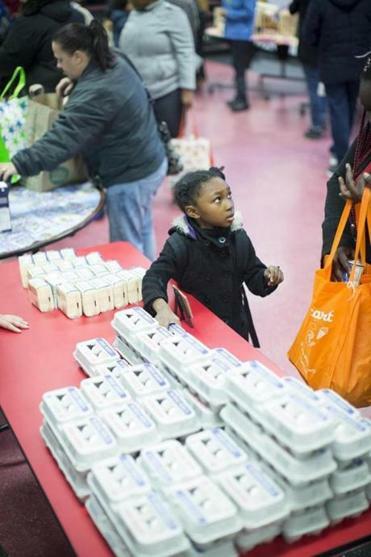 Ominique Holmes, 6, checks out the eggs. Karla Desire, here with her 6-year-old daughter, Ominique Holmes, appreciates that the market offers “a lot of healthy stuff for the kids. It’s a really good thing.” Ominique is more focused on the juice — and yogurt, she adds in a barely audible voice with a bashful grin. Food for Free picks up the food, already frozen, from Harvard. Mallon coordinates volunteers who package a protein, vegetable, and starch into TV dinner-like containers. “I get volunteers all the time,” she reports. Wyse receives and distributes the meals at school.